This is a fun Subjects/Predicates Sorting Activity. Perfect for centers! Students simply sort the cookies into 2 jars. 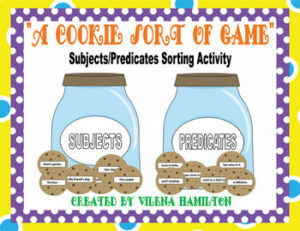 As an extension of this activity have the children build “cookie” sentences by matching the subjects with their predicates. I hope you find this product useful.